This upwards movement cannot be a leading diagonal within intermediate wave (5) followed by a second wave correction because the leading diagonal wave lengths do not work. 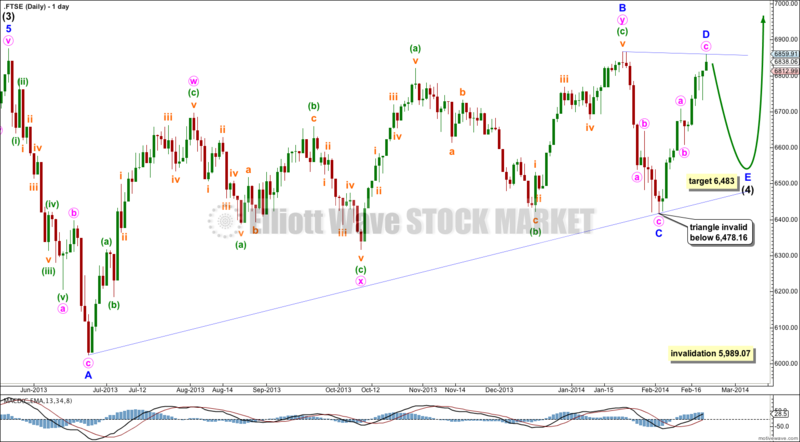 It looks unlikely now that it is an incomplete flat correction for intermediate wave (4). It may be a barrier triangle, but minor wave B looks out of proportion to minor waves C and D. This gives the wave count a slightly odd look. If it is a barrier triangle then minor wave E may end about 6,486 where it is 85% the length of minor wave C. Minor wave E may not move beyond the end of minor wave C. The triangle is invalidated with movement below 6,478.16. If the triangle is invalidated then it is just possible that intermediate wave (4) could be a double combination. However, that would see minor wave X within it also a double which is technically possible but very unusual. That wave count would have a very low probability. Intermediate wave (4) may not move into intermediate wave (1) price territory. Movement below 5,989.07 would invalidate this wave count. Ah, thanks for doing this. I concluded the same about the potential triangle, but you’re right, Minor Wave B certainly looks disproportionate. Yeah, I’m not entirely happy with it. It’s the only wave count at this stage that I can see which fits but I don’t have a lot of confidence in it. The situation with FTSE should clarify shortly, I hope!